Ms. Celiac Says...: Let's Make A Trip To Babycakes NYC! Let's Make A Trip To Babycakes NYC! To those of you who are unfamiliar with the bakery, Babycakes, it is located in downtown Manhattan and offers a wide selection of gluten free baked goods. This holiday season they have created a special "Holiday Menu" that offers many gluten free treats for us all to enjoy. So, if you do not have the time or energy to bake or if you just want to try something new, why not order some of these gluten free items for your holiday parties? If you live in NYC, you can have them delivered for $21 if you are below 59th street, $25 if you are between 59th and 70th and $30 if you are between 71st and 96th street. For those of you in the contiguous 48 states, you may have their items delivered via FedEx. 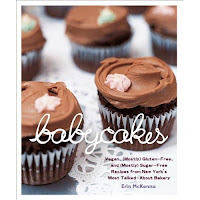 Also, Babycakes: The Cookbook is available to order at Ms. Celiac's Market. It would make a great gift for a gluten free friend or family member this holiday season! Thank you so much for posting this menu, Ms. Celiac! We really appreciate you spreading the word! Time For A Family Classic! Don't Forget To Watch Dr. Oz Tomorrow! Let's Get Ready For The Holidays!